Sony Alpha 7R review: Highest ever full-frame image quality? The Sony Alpha 7R is the higher-end, higher-pixel count version of two new compact full-frame mirrorless cameras from Sony to feature the firm’s existing E-mount. The two models share the same body and many features and differ really only by their sensor. 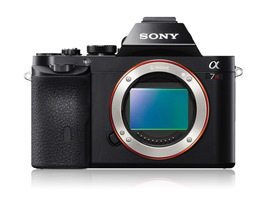 The more modestly priced of the two, the Alpha 7 has a 24-Mpix sensor but with the added capability of phase detection AF afforded by an on-chip pixel array. The A7R on the other hand has a full-frame 36-Mpix sensor without an optical low pass filter for optimal resolution and image sharpness but lacks the faster focusing of its more modestly priced sibling. Both models accept existing APS-C format E-mount lenses, albeit with the inevitable cropping. However, to take full advantage of the larger sensor, Sony has introduced a range of new full-frame F-E lenses. Sony DSLR users need not feel left out either, as the camera is compatible with existing A-mount full-frame and DT (APS-C) lenses using an optional adaptor. Along with a new Bionz X processor, the two metal-bodied cameras feature a 3-inch tilting rear LCD, XGA OLED electronic viewfinder, 1080/60p video, WiFi with NFC and a multi-interface accessory hot-shoe. Availability is expected the beginning of December, and will priced at $2,299 for the A7R, while the A7 will set you back $1,699. 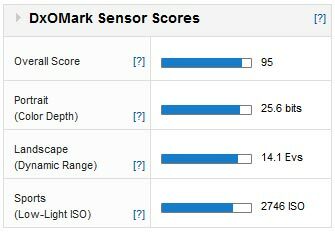 With a DxOMark Sensor score of 95 points the image quality of the A7R is notable as one of the best performing sensors ever analyzed in our labs. 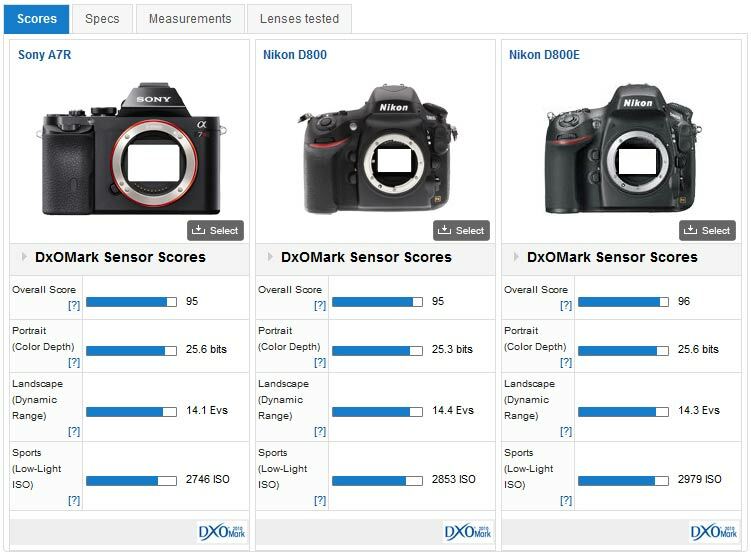 It’s ranked side-by-side with the 36-Mpix Nikon D800 and is just one point behind the Nikon D800E DSLR. However, as a mirrorless camera it’s the best performing of its type. 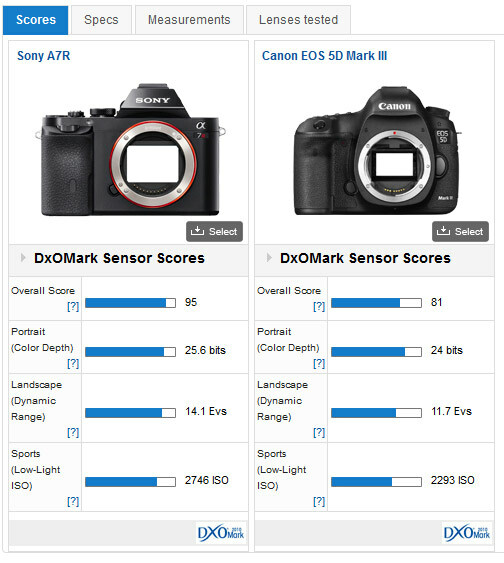 The similarity of the scores suggest that the Sony sensor is the same chip that’s found in the D800 models. 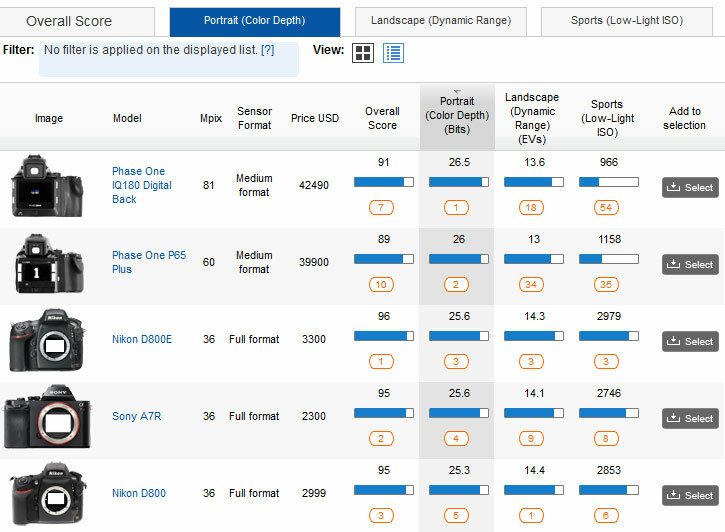 The Sony is in joint fourth place for color depth alongside the Nikon D800E. These are very high scores indeed and are only fractionally behind the Phase One P65 Plus models with their higher 16-bit A/D conversion. However, bear in mind that the P65 Plus models aren’t the latest from the firm. Although the Sony A7R ranks in eighth place for low-light ISO scores in our database, it is still an excellent performer given the high pixel count). Bear in mind the ISO rating is a logarithmic scale and that, at first sight, what appear to be large differences, are, in fact, actually quite minor. For example the low light score difference with the D800 is less than 0.1 stop. 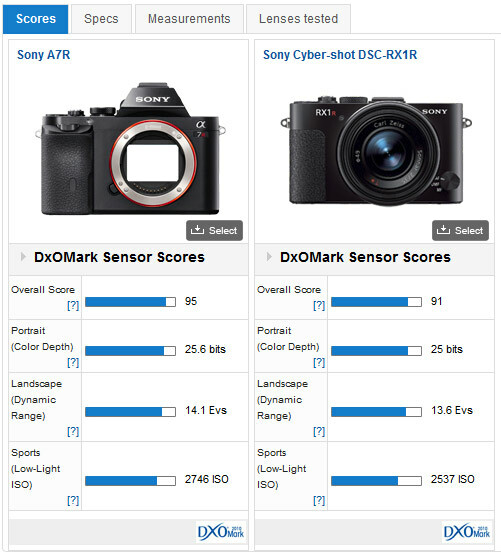 Sony A7R vs Nikon D800 vs Nikon D800E: Same Scores, Same Sensor? 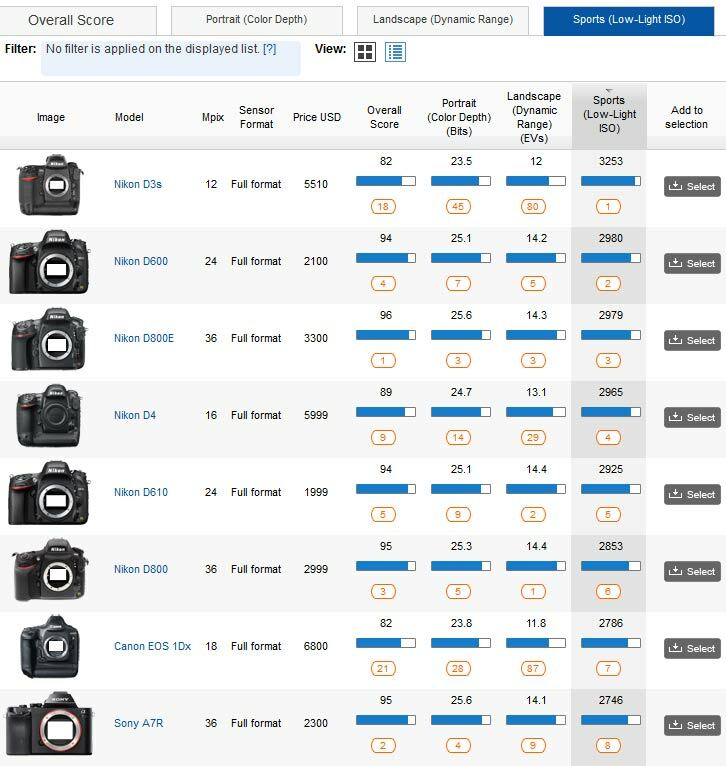 Compared to the 36-Mpix Nikon D800 models, the results are very similar indeed, implying the new Sony A7R uses the same (Sony made) sensor. The differences in individual metrics are close enough to be within our tolerances for testing, however, it maybe also be down to the differences in the filters or the imaging chain in more general terms. 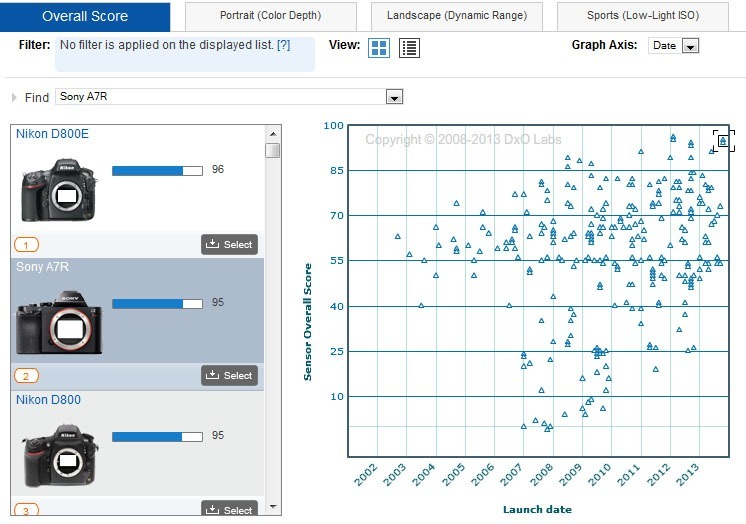 In real world use, the variance in low-light scores is negligible. As for assessing image sharpness, we’ll be adding lens tests with the Sony in the near future. Although the Sony is a tiny mirrorless camera, it will be competing directly against traditional pentaprism-based DSLRs like the Canon EOS 5D Mk III. As the Sony sensor performs much like that found in the D800, it’s perhaps no surprise to see the Canon EOS 5D MK III lagging a little, particularly in dynamic range. But it’s fair to say the Canon is a very good performer (and although not shown here it has outstanding resolving power), even if in the lab it doesn’t do quite so well in the tests against the Sony sensor. Against the firm’s rightly popular and hugely inspirational 24-Mpix full-frame Cyber-shot DSC-RX1R, the new model improves on each of the metrics by a small but meaningful margin. It’s made all the more relevant when you consider the increase in pixel count. However, while we’re optimistic, it remains to be seen whether that translates into improved resolution and image sharpness, especially as Sony has yet to announce a similar high-grade Zeiss 35 mm f2.0 for the new model. Although we can’t provide any commentary on image sharpness at this stage in our tests, the sensor in the Sony Alpha 7R performs exceptionally and is on a par with that found in the D800 models. Given the Sony’s small size, low weight and outstanding sensor performance, it’s one of the most intriguing and compelling new additions in recent times.